"My big fish must be somewhere"
The surf clam and ocean quahog fishery on Georges Bank has been closed for decades due to concern over unknown, potentially dangerous levels of the toxins that cause paralytic shellfish poisoning (PSP) in the clams. Many years of research and collaboration between industry, state and federal regulators, and researchers has resulted in the recent approval of a "Dockside Testing Protocol", which requires a layered approach of screening on board the harvest vessels, in addition to tightly controlled dockside sampling of harvested clams, before any shellfish can be released for commercial use. RAI routinely provides National Shellfish Sanitation Program (NSSP) approved testing for PSP that is required as part of the Protocol, helping to sustain the safe harvest of surf clams and ocean quahogs from this rich resource area. Scientists at Woods Hole Oceanographic Institute (WHOI), in partnership with a long list of national and regional collaborators, have successfully launched a series of robotic instruments designed to automatically sample the waters in the Gulf of Maine for the presence of harmful algal species, including Alexandrium sp., which cause the "red tide" events that regularly plague New England waters in the spring and summer seasons. These Environmental Sample Processor (ESP) buoys have been providing New England shellfish managers with real-time data on the abundance and location of Alexandrium sp. since the onset of the bloom in 2014, and staff at RAI have partnered with local fishermen to collect regular phytoplankton samples at one of the ESP buoys located several miles offshore of Casco Bay, in order to provide critical data that will help to ground-truth the effectiveness of the automated data that the buoy is collecting and sending out to scientists and managers. For more details on the exciting and innovative ESP monitoring project, the scientists involved with the development and launch, and a links to other current New England red tide information, check out the press release from WHOI. 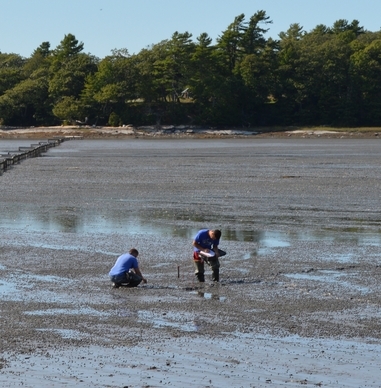 While soft-shell clam populations are in decline in mid-coast Maine, many areas are now seeing a resurgence in the recruitment and successful growth of large populations of the Bay Quahog, Mercenaria mercenaria. 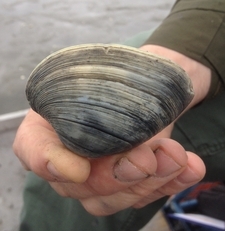 While this species of hard clam is well studied in the mid-Atlantic region, the Maine populations are unique, and if shellfish managers and harvesters want to successfully encourage the growth and sustainable harvest of these clams, we need to better understand their population dynamics and local growth curves. RAI has partnered with the Brunswick Marine Resource program and MER Assessment Corporation to study this exciting new addition to the Maine shellfish industry. Clams that are marked for the growth curve study will grow in situ for the summer and fall of 2014, then we will pull the clams in the late fall to assess seasonal growth rates among different size classes of the clams, which will help managers to estimate future harvestable yields from current standing crops. Brunswick Marine Resource Officer Dan Devereaux holds a Bay Quahog we recovered from the study site on June 12 to check the health and status of the marked and replanted shellstock. Three weeks after replanting the marked quahogs, our nets were still solidly in place, and were not fouled with any biological debris. All of the clams we pulled from the site were alive, appeared healthy, and were already laying down new shell across the notched areas we placed at the shell edges to measure growth. We hope to have a very high recovery of this stock in the fall, and are very excited to document the growth rates from this year. European green crab destruction of intertidal areas in Brunswick is impacting important wading bird and finfish/shellfish nursery habitat, as well as destroying commercially valuable native shellfish species. Economic impacts on the coastal community are imminent. Funding for the project has been secured through a Maine Coastal Program grant, as well as matching funds from the Casco Bay Estuary Partnership and the New Meadows Watershed Partnership, with in-kind matching funds from the Town of Brunswick and RAI. Municipal government, private sector scientists, commercial shellfish harvesters, and local students will partner this spring to deploy predator fencing and traps in Buttermilk and Woodward Coves in Brunswick, with the goal of achieving manageable (non-destructive) biological targets for invasive European green crabs in these critical habitat areas. Mark-recapture sampling will track impacts to green crab populations in these areas, and shellfish surveys will assess any impacts on shellfish population recovery in these areas following crab removal efforts. The town of Freeport, Maine contracted with RAI in the summer of 2013 to design and carry out a study to determine what environmental factors might be contributing to the decline in local shellfish resources, and to analyze the results of the study and make recommendations to the town for potential improvements which may be made to the shellfish habitat. RAI staff has focused on testing the sediment pH, and sampling for saturation state to determine if ocean acidification might be impacting shellfish settlement and survival, as well as carrying out predator fencing and trapping experiments to measure the impact of natural predation on shellfish resources. A final report with findings and recommendations is available for download.